Review: A group of six middle-class friends attempt to have a meal together although they are continuously interrupted by a series of bizarre dreams and events that keep unfolding in front of their eyes. 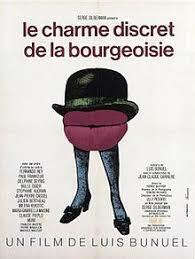 This is Luis Bunuel’s finest achievement as both film-maker and social commentator. There were some very funny comedic moments which made me laugh. The three performances that stand out for me are Delphine Seyrig, Michel Piccoli and Fernando Rey. Acccording to the BBFC website, when this film came out in 1973 it was originally classified as ‘AA’ which meant that no persons under 14 could see this film. In 2006 when this film was put on DVD format. It was then classified as a ’15’ certificate. It focuses on all the director’s favourite themes, which include sexual repression, religious hypocrisy and also patriarchal paranoia. In the book 1000 Films to Change your Life there is a little summary of this film and it asks the questions Are the people prevented by their own fantasies? By their lack of purpose? By their discreet charm? The thing is that Luis Bunuel never really lets us know. This is a quotation taken from film critic Roger Ebert’s 1972 review of this film “The best explanation of this film is that, from the standpoint of pure reason, there is no explanation.” At the Academy Awards in 1973 this won one Oscar and that was for Best Foreign Language Film. At the Bafta Awards in 1974 this won for Best Screenplay and Best Actress (Stephane Audran).